With the US Senate debating the healthcare bill in the other Washington, I had the privilege yesterday of meeting Tim Kaine, governor of Virginia. This was Governor Kaine’s second visit to Seattle since becoming Chairman of the Democratic National Committee. Governor Kaine discussed a wide range of topics with a small group assembled in the living room of my neighbors, Eric and Suzi LeVine. Foremost on everyone’s minds was healthcare and the war in Afghanistan but the governor also addressed the recent off-year elections, balancing needs of business and labor, and the party’s strategy for 2010. Politics has a way of turning its practitioners into sound-bite spewing automotons but Governor Kaine seems completely at ease with his roles as chief executive of the Commonwealth of Virginia and leader of a large and unruly political party. Once his service to his state and the nation concludes, one can easily imagine the term-limited governor returning to his prior life as a civil rights attorney. 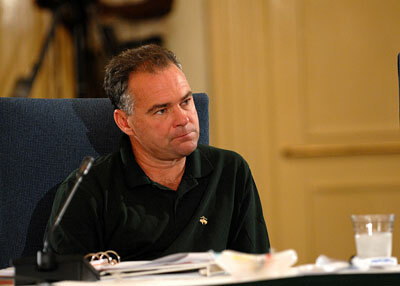 Governor Kaine at the 2006 Annual Meeting of the National Governors Association. Photo credit: NGA. The photo above isn’t the most flattering one you can find but it shows Tim more or less as a regular guy (granted, that’s a Brooks Brothers polo). If I had photographers following me around at work (and I most certainly do not), that’s the facial expression I would have most of the time. Though it was not discussed yesterday, the governor recently made the New York Times Magazine’s “9th Annual Year in Ideas” list for his cul-de-sac ban. I have been a lifelong fan of square blocks but I didn’t realize one could actually ban cul-de-sacs, a dead end idea if there ever was one. Lastly, I would be remiss if I did not conclude with one more kudo for Suzi LeVine, the evening’s host and master of ceremonies. She’s one of those rare private citizens who doesn’t just talk about making the world a better place, she organizes and makes it happen. It’s inspiring to have that kind of leadership in the community.